This is the best use of your stash ever! 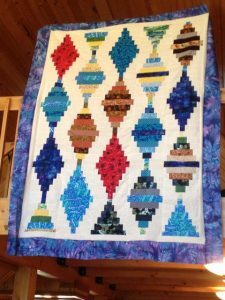 Simple sewing skills are all that you need to make this stunning quilt. It is jelly roll friendly and comes in 3 sizes*crib, twin, and queen. We will make the twin size in class. 31 strips 21/2* x 42* of various colors. 2 1⁄4 yd neutral for background. 1 5/8 yd border fabric. If you are using your stash, please have 31 strips cut at 2 1/2* x 42* of various fabrics Or at least 60 pieces of 2 1⁄2 x 12* pieces. If you are using a jelly roll, no advance cutting is needed.